I’ll have a full rundown of the options later. The short of it is that new fares go into effect on March 19, 2017, and the MTA Board will vote on one of the two proposals following eight public meetings that will be held throughout December. If the past is prologue, the MTA will go with Plan B — a jump in the base fare but a substantial pay-per-ride discount. Either way, those 30-day unlimited ride cards will soon cost $121, nearly double what they cost in 1998 when they were first introduced. 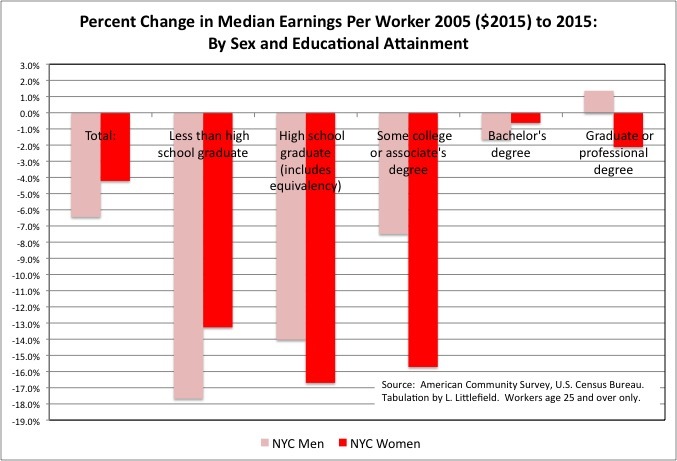 Here is the change in the average pay level of NYC residents from 2005 to 2015, adjusted for inflation. How does that compare with the price of a fare. And how does the inflation adjusted fare increase from 2005 to 2015 compare with 1995 to 2005, before Generation Greed moved to Florida? As I’ve been saying for years, the Metrocard “bonus” or “discount” is bullcrap. The reality is that a huge and rising share of what we pay, as toll payers, fare payers and taxpayers, is being sucked into the pasts by the debts, retroactive pension increases and pension underfunding, and inadequate infrastructure investment of Generation Greed. That would represent the reality, and let people understand why they are paying more and service gets worse. That would be a mortal sin in New York, that of admitting the truth. Same holds true in Trumpland. Let’s stick to transit related talk. Trump had nothing to do with the MTA. You misunderstand. In Trumpland, the truth is what they say it is, no matter the facts. In Trumpland, the sky is orange, even if the rest of the world sees blue. Because Trumpland says so. Quite tired of the pre, during and post election hissyfits. T vs C whinging is like a a fanfest fight about the Joker vs Freeze. Neither are quite the good guys, though they may be so cast in one episode. The MTA is run by the NY State, but financially speaking, it is a somewhat separate entity; that is, the MTA can borrow money separately from the state – as I understand it, the income stream from all those tolls on the city bridges and tunnels, not to mention the income stream from all the fare revenues, make a pretty attractive package when trying to sell bonds. The Governor has two major constituencies when it comes to transportation, highway and public transit (airports/air travel are sort of separate, and at least some of them have their own ‘Authority’ providing funding). The Guv likes to ‘Get things Done’ and this needs funding. Highway funding is relatively easy-peasy in Albany – after all, who doesn’t like the smell of fresh asphalt. Transit, on the other hand, is more a downstate item and it is a tougher sell up there. So Cuomo gets the legislature to fund the highways with the State’s credit if necessary. As for the MTA, Cuomo does whatever he does to ‘allow’ the MTA to borrow more money; no problem with upstaters, it doesn’t cost them any money. Voila, everyone gets something and that’s all she wrote, Cuomowise – Win-Win. It obviously seems shortsighted, but these things can apparently be juggled for quite some time provided that fares and tolls are raised now and then, etc. It would be nice to think that the outstanding MTA bonds are being at least partly paid down instead of being completely rolled over ad infinitum – Does anyone really know out there? I’m not sure what happens if/when this house of cards falls down – does someone/something bail it all out? . . . and what happens to the system while the finances are wallowing in the muck; it can’t really stop, so someone/something is going to have to deal with it somehow. No SAS Phase 1, no fare hike. How about no shovels in the ground for Phase II, no fare hike. Good, anything that can be done to reduce crowding in the short term is a plus. I wonder is the MTA required by law to keep the much costlier access-a-ride, and just uses the multiple ride discount as a way of getting around that, which is crafty and means of course they will do option B. Every year around fare hike time, someone says this, as if the goal of a transit operator should be to suppress demand as much as possible. A good transit operator is one with no riders! Unfortunately, Federal do-gooder law requires paratransit trips to be at the same fare as regular service. As an Access-a-ride user myself, I believe that’s too cheap. Make it 2x, still cheap but providing an incentive to take the subway or bus whenever possible. AAR is quite the pain to use, but considering that this in NYC you should expect as much. The law is that para transit fares may not be more than twice the regular transit fare. This is despite the enormous cost to provide such services witch are eating up transit agency budgets across the country. Do fully accessible transit systems have paratransit mandates? 3) The disabled, if the route from their home or work is not itself ADA compliant. This is also weather aware; got snowy streets that a wheelchair can’t handle? It’s now the transit agency’s fault. Both scenarios cannot be fixed by the agency as the infrastructure wouldn’t even be owned by them. WMATA is more or less 100% ADA compliant and pays LOTS of money on paratransit. This is also one reason why we have so many bus stops that are so close; they are stupid but can save paratransit costs as now you can say “The bus stop is on your block”. The MTA could reduce costs with full ADA compliance, but maybe not by enough to make it worthwhile. IMO the law should be: if a route is not accessible, the agency must provide accessible alternative transport along that route. Once that route is accessible, the paratransit requirements go away. None of this bad incentives stuff we have where one agency is on the hook for another agency’s failure. Option B seems to be the smaller increase based on the Effective Fare with Bonus, not that the differences are that large between the two anyway. The only advantage of option A is that it keeps the single ride fare lower. Certain segments of the population that cannot afford to use the Metrocards with the bonus and end up paying the higher single ride fare would be better under option A, however I believe that there are much better ways to help that segment of the population than by keeping the single ride fare lower. It basically comes to the fact that the MTA is not the right agency to be helping the working poor — the mayor and the city agencies he controls are much better at that than the MTA. With that put of the way, Option B is the lower increase option, so yeah, it is likely to be the one selected. Poor or not, who and how many actually are using the literally single-fare option? If you get on a bus or subway to go somewhere, are you not returning? That means 2 fares. Or are you given that return fare once you arrive at your destination? My fiancee will one way trip to work some times, then walk home. She has an auto-refill card though, so she’s sometimes at the or below the monthly cost. These proposals are 2.23% to 5.65% higher than current, or around 1.6% – 2.8% a year. According the consumer price index numbers released this morning, the 12 month CPI increase was 1.6% overall, and 2.1% excluding food and energy. Since the MetroCard was introduced, the CPI has gone up 48%, while the MetroCard has gone up 92% – 94%. The price hike over the period from 1997 to 2017 is an average annual growth rate of 3.3%. According to data available from the St. Louis Federal Reserve Bank, CPI increased at a 2.1% annual rate over that same time period, and according to the Bureau of Labor Statistics, CPI for the New York-New Jersey area has increased at a 3.1% annual rate over the past 30 years. So given that data, a 3.3% rate of increase doesn’t seem far out of line. On a personal note, my rent has increased at a 4.0% rate over the 1997-2017 period. On a side note, to the extent that there is fraud, waste, and abuse at the MTA, neither the Governor, NY State AG, or U.S. Attorney seem to have any interest in tackling that issue. If the MTA was designed to maximize production per dollar rather than to maximize campaign contributions and rewards for cronies it would cost much less to run. It is a jobs for votes and money washing machine which also outputs, grudgingly, a certain amount of transit as a side product. But look at this shiny new bridge that Andy is going to name after his dad! Is the system on the right track? Well it depends. Are you talking about locals or expresses? Keep the fares rising, the system is underfunded and very cheap for transportation cost. And kill all the pensions. The falling cost of UBERpool demonstrates that this is not true. Though if every straphangar started using uberpool, our streets would be so clogged that nobody would want to use uberpool anymore. The MTA has better farebox recovery than Uber.